I have never seen an entire episode of 20/20. Years ago (and I am talking years), I would stumble in my apartment after a great happy hour (s) and flop on my couch. Usually it was about half-way through a good episode of 20/20 when the effects of a long work week and a large amount of alcohol would send me drifting into dreamland. Back then I didn't even care what was on 20/20. Now I actually find the stories interesting and engaging, but I still fall asleep halfway through. Minus the happy hour and alcohol. You see now, I am just tired and getting old (the first clue was finding 20/20 interesting). By Friday my eye overhang is taking over. What is eye overhang you ask? It is a genetic problem...I am a little upper lid heavy. For years I have been addicted to my eyelash curler, I don't leave home without it, and swear it helps me stay awake (helps keep those upper lids up). Love how Wade takes his pacifier out to try and use the eyelash curler. Of course I turn to pop culture to ease my insecurity about such vanity issues. Diane Keaton is an example of cool older woman eye overhang. I feel good seeing her onscreen and of course she just happens to be in some of my favorite movies---"Annie Hall" (pre-saggy eyes), "Father of the Bride" (1 and 2), "Hanging Up" and "The Family Stone." 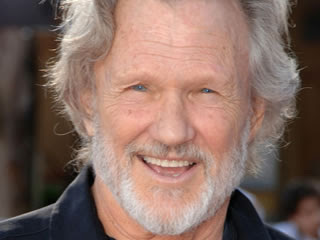 But then I was watching "Dolphin Tail" with my kids a few weeks ago and got a good look at what scary saggy eyes can look like....on Kris Kristofferson. Of course, since he is a man he can still seem cool. Even though he can barely open his eyes. Another sign that I am getting old? Asking a good buddy to be my safe ride home from an upcoming medical procedure. A scope for digestive issues nonetheless. I mean the last time I was asking for a safe ride or a driver was back in college when I was planning on drinking too much and having too much fun. Don't get me wrong, yes I am feeling older, but in a lot of ways, I am so much healthier than years ago. I run, eat healthy, don't drink that much and take good care of myself. But I am indeed tired (especially on a Friday night). I went to the doctor last year convinced I had a thyroid or hormonal problem because I was so damn tired (and I checked off everything on a Dr. Oz show checklist for thyroid problems). After several tests and doctor visits and everything was ruled out, my doctor looked at me and said, "You have four little kids and your husband works a lot, that's your diagnosis. You are simply tired from life." Isn't there a pill for that? For now, my goal is to stay up on Friday night and actually hang out with my husband. Maybe we'll skip 20/20 and watch a movie. Maybe one we've seen before just in case we both fall asleep. Not 40 quite yet, but this is a VERY funny video about getting older and turning 40. LOVE IT!